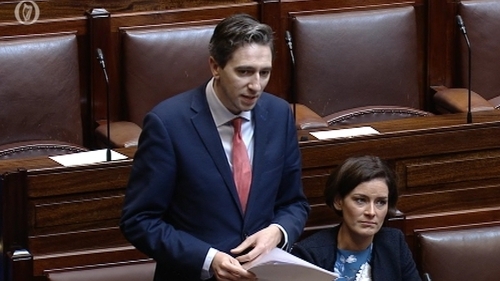 The Minister for Health has written to the Oireachtas committee responsible for examining amendments to the abortion legislation, requesting it meet at the earliest convenience. Committee stage of the Regulation of the Termination of Pregnancy legislation will be overseen by the Health Committee. The request from Simon Harris could see the Committee considering amendments to the legislation during the October recess. However, the Chairperson of the Committee Dr Michael Harty said consideration had to be given regarding the large number of amendments that are expected and to allow everyone an opportunity to be involved in the process. He said the suggestion will be put to members when it meets next week. Earlier, the second stage debate on the abortion legislation concluded in the Dáil. It will be voted on by TDs on Tuesday before it moves to Committee stage. Mr Harris reiterated today that he wanted to see abortion services up and running early next year. The minister also noted the "huge responsibility" of introducing a bill "along the lines" that people voted on, in the Referendum on the Eighth Amendment. Earlier, Sinn Féin TD Kathleen Funchion expressed hope that the legislation would pass in a timely manner. She also said she would like to see the 72-hour waiting period to be removed, describing it as "unfair". Ms Funchion also sought to clear up her party's position regarding the passage of the legislation through the Oireachtas. She said a Deputy spoke from her party's benches last night who did not speak for Sinn Féin, because it is policy "is to see removal of the Eighth Amendment". Yesterday evening, Peadar Tóibín expressed concern over the legislation being rushed through the Oireachtas. He said no one should be shy in rigorously challenging the bill because he said it would be a "live political issue" for years to come. Today, a Fianna Fáil TD expressed concern that the legislation to change Ireland's abortion laws will mean lead to abortion become "the contraceptive of choice" in future. Marc MacSharry has said he will not support the legislation next week as he cannot separate his personal view from his legislative responsibilities. He told the Dáil: "Given the outcome of the referendum and the people have spoken, I very much hoped I would be in a position to separate my personal view on this issue from legislative responsibilities. "I said after the campaign that I would support the legislation. Sadly, I have been struggling an awful lot with my conscience on this issue and I am not sure that I can." Mr MacSharry said: "This is borne, quite frankly, out of fear. "I fear this will become the contraceptive of choice for people down the line. Not today, not even next week but in time. And that it will just become something that is the norm as opposed to the hard cases."